In evaluation efforts, Health Resources in Action (HRiA) employs a vigorous scientific approach while also building the capacity of organizations to integrate evaluation into their work. This is true for HRiA’s newest project, a $2.75 million evaluation of SÍ Texas: Social Innovation for a Healthy South Texas. SÍ Texas, based in San Antonio, is sponsored by the Methodist Healthcare Ministries of South Texas and funded by the Social Innovation Fund of the Corporation for National and Community Service. In May 2015, HRiA’s Research and Evaluation team kicked off the SÍ Texas evaluation. This complex multi-year initiative takes a Collective Impact approach to regional creating systems change in 12 counties in South Texas. The project will address integrated behavioral health and aim to improve behavioral health and physical co-morbidities, including diabetes and hypertension. As third-party evaluators, HRiA is leading the evaluation for both the overall initiative and collaborating with nine local grantees on their site-specific evaluation. Our Research and Evaluation team has a dedicated SÍ Texas Evaluation Project Manager, Rebecca Adeigbe, leading efforts on the ground in San Antonio and coordinating HRiA’s 10-member SÍ Texas team. HRiA’s role in SÍ Texas goes beyond evaluation. Our goal is to build the capacity of community-based health organizations to conduct their own evaluations and develop vital evidence of the effectiveness of local models. “Our team values an engaged, community driven evaluation process and is committed to building local sites’ skills and infrastructure around evaluation. We understand the complexities and constraints of on-the-ground work and are taking an empowerment evaluation approach so organizations build their evaluation capacity for future work.” says Lisa Wolff, Director of HRiA’s Research and Evaluation team and the Principal Investigator for SÍ Texas. 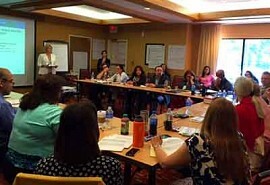 HRiA’s Research and Evaluation Team works with a variety of clients such as health departments, hospitals, schools, foundations, and community organizations to provide valid, reliable data for developing, implementing, and improving health and social programs and initiatives across the United States. These services help guide each step of program and policy planning by assessing community strengths and needs, determining potential key partners, understanding issues salient to target audiences, identifying challenges, and evaluating progress and impact. MHM is a private faith-based not-for-profit organization dedicated to providing medical, dental and health-related human services to low-income families and the uninsured in South Texas. The mission of the organization is “Serving Humanity to Honor God” by improving the physical, mental and spiritual health of those least served in the Rio Texas Conference are of the United Methodist Church. The mission also includes MHM’s on-half ownership of the Methodist Healthcare System, the largest healthcare system in South Texas, which creates a unique avenue to ensure that it continues to be a benefit to the community by providing quality care to all and charitable care when needed. For more information, visit mhm.org.